there will be interruptions! I used larger pork chops than I needed, but I had purchased these pork sirloin chops on sale for $1.69 per lb., so this was a very economical meal. I browned them for a couple of minutes longer so they would get done. The recipe calls for apple cider, but I substituted apple juice and it was delicious. Hope you enjoy! Heat a large skillet on medium high heat and add 1 T. oil. Brown chops on both sides; remove chops from pan and set aside. Pour 3/4 cup of the apple juice in skillet along with the next 5 ingredients. Bring to a boil, cover pan with a tight fitting lid and reduce heat. Simmer for 10 minutes. 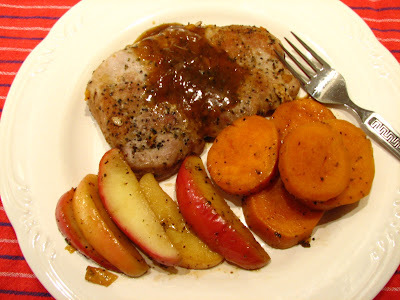 Add pork chops back to the skillet along with the apple slices. Cover and simmer for another 10- 15 min. until sweet potatoes are tender and chops are done. The apples should be done but not mushy. 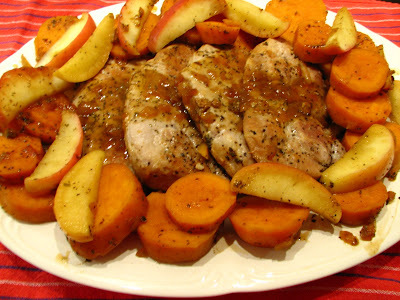 Remove the pork chops, sweet potatoes and apples to a serving platter, reserving the drippings in skillet. Combine the reserved 1/4 cup apple juice and the cornstarch and stir until smooth; stir into drippings in skillet. Stir constantly until mixture thickens and boils. If the sauce gets too thick add a little more apple juice. Boil 1 minute and then pour over pork chops. We love the flavor of the sauce. The onions soften and kind of caramelize in the juices which adds a delicious sweetness to the dish. This time I also served green beans and crusty bread with the meal, as my husband was really hungry! Do you like to fix one pan meals? That looks like a wonderful dish for the winter. Love the combination. Thanks for sharing! I love one pan meals, sometimes I'll roast a tri-tip and vegetables in a pan and call it dinner! This looks great. A wonderful winter dish. Especially now, with snow and cold wind all around -- looks yummy. BTW, I've passed on two blogger awards to you. Go to my site for info (judyskitchen.blogspot.com).